Gallia Academy junior Ashton Webb (11) spikes the ball over a Logan Elm defender during the Division II district semifinal on Oct. 25 in Londonderry, Ohio. The Ohio High School Volleyball Coaches Association has released its 2017 All-Ohio teams, featuring Gallia Academy junior Ashton Webb. Webb — who helped lead the Blue Angels to a 23-2 record and a third straight sectional championship — was named to third team on the Division II All-Ohio list. 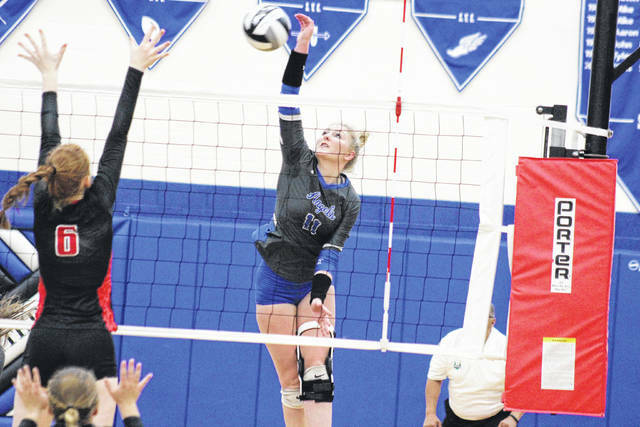 Webb is the second Gallia Academy volleyball player to be named All-Ohio in program history, joining current GAHS senior Grace Martin, who was honorable mention last season. A verbal commit to Ohio University, Webb posted 399 kills, 45 blocks, 119 aces and 200 digs for the Blue Angels this season. Meanwhile, the 6-foot-1 junior boasted a serving percentage of 79.6 and a hitting percentage of .310. The Division II Coach of the Year was Jim BeHarry of Padua Francican, while Coaches Achievement Awards were given to Jackie Gezo of Oak Harbor, Rob Terrill of Highland and Tina Jasinowski of Archbishop Alter. Dana Axner, Dublin Coffman; Diana Brown, St. Francis DeSales; Logan Case, Ursuline Academy; Kacie Evans, Wadsworth; Natalie Steibel, Mount Notre Dame; Ali Thompson, Ursuline Academy; Riley Wagoner, Dublin Coffman; Shannon Williams, Brecksville-Broadview Heights. Anna Brinkman, Mason; Joanna Chang, Brecksville-Broadview Heights; Grace Dynda, Notre Dame Academy; Alexis Falzone, Mentor; Armania Heckenmueller, Mount Notre Dame; Maggie Huber, Ursuline Academy; Abbie Hughes, Mason; Teagan Ochaya, Mentor. Kirsten Badowski, Brunswick; Hannah Bolinger, St. Ursula Academy; Maddie Fogg, Olentangy Liberty; Maggie King, Mason; Carrigan O’Reilly, Olentangy Orange; Maryn Shinaberry, Walsh Jesuit; Maddie White, Ashland; Nikolette Zanolli, Massillon Jackson. Sarah Benson, Massillon Jackson; Rachael Crucis, Brunswick; Samantha Fallis, Southview; Remy Gerken, Centerville; Jillian Grant, Anthony Wayne; Brianna Hollingshed, Pickerington North; Scottee Johnson, Centerville; Chiamaka Nwokolo, Bishop Hartley; Paige Beck, Northview; Marie Plitt, Loveland; Emily Schillinger, Avon Lake; Tory Small, Steele; Madison Smith, Hilliard Darby; Lizzy Stefanov, Stow-Munroe Falls; Julia Vermilion, Pickerington North; Justice Wingate, Notre Dame Academy; Sarah Wiegand, Steele. Audrey Binzer, Archbishop Alter; Peyton Bloomer, Oak Harbor; Katie Forsythe, Gilmour Academy; Elise Gray, Padua Franciscan; Lauren Park, West Holmes; Adria Powell, Hubbard; Josie Pry, New Philadelphia; Raina Terry, Highland. Ila Angermeier, Lake Catholic; Keanna Avery, Claymont; Madi Eberst, Unioto; Ella Grbac, Gilmour Academy; Marie Gross, Archbishop Alter; Macie Rhoads, Logan Elm; Erin Shomaker, Granville; Grace Turner, Archbishop McNicholas. Ashley Browske, Lake Catholic; Carly Carafa, Graham Local; Addison Conley, London; Faith Grant, Howland; Olivia Kearns, Lexington; Abigail Leigh, Padua Franciscan; Norah Painter, Shawnee; Ashton Webb, Gallia Academy. Zoe Carmichael, Triway; Emma Conrad, Sheridan; Anne Davidson, Norwalk; Autumn DeSantis, Cardinal Mooney; Kelsie Imertreijs, Big Walnut; Madison Kasper, Beaumont; Alaina Kelley, Norwalk; Sawyer Lorentz, Dover; Ella Mihacevich, Padua Franciscan; Bridget Oder, Highland; Natalie Pallone, Girard; Zoey Peck, Marlington; Jaci Pridemore, Carrollton; Lexi Sauber, Wauseon; Sally Sterkel, Notre Dame-Cathedral; Latin Ashley Taylor, Unioto. Jackie Gezo, Oak Harbor; Rob Terrill, Highland; Tina Jasinowski, Archbishop Alter. Jenni Carmichael, Buckeye Trail; Maura Collins, Independence; Alexis Gilland, Tusky Valley; Tasha Kahlig, Coldwater; Emily Londot, Utica; Katelyn Meyer, Eastwood; Jonni Parker, Miami East; Kierrah Stewart, Tusky Valley. Carly Alt, Ottawa-Glandorf; Camryn Chandler, Piketon; MacKenzie Daub, Crestview; Lauren Gilliland, Coldwater; Marisa Gwinner, Galion; Kyndall Hellyer, Miami East; Camryn Jarrett, United; Olivia Lagando, Huron; Ellie Ruby, Wheelersburg. Maddy Bilinovic, Independence; Samantha Canner, Buckeye Trail; Anna Donner, Northmor; Abbi Gillson, Tusky Valley; Charlee Louden, North Adams; Natalie Restille, Crestview; McKenna Tucek, Berkshire; Danielle Winner, Versailles. Mya Blochlinger, Hiland; Madisynn Bryk, Hiland; Jenna Franks, Tusky Valley; Lauren Goebel, Southeastern; Hannah Horn, Tinora; Sydney Kendall, North Adams; Brooke Kleman, Ottawa-Glandorf; Erin Krupar, Canton Central Catholic; Emma Meyer, Anna; Kim Miller, Hiland; Jordyn Mitnik, Edison; Abigail Schroeder, Eastwood; Magey Shambre, Crestview; Lanie Shea, Adena; Ella Skeens, Southeastern; Lexi Wise, Ironton. Cortney Goodwin, Tuscarawas Valley; Jeff Beck, Eastwood; Jeff Beros, Buckeye Trail. Brianna Gillig, New Riegel; Meghan Hedrick, St. Paul; Paige Jones, New Bremen; Jenna Karl, Buckeye Central; Raquel Kessler, Jackson Center; Sydney Kin, Carey; Britney Siefring, St. Henry; Melina Woods, Ada. Kara Evers, Marion Local; Carrie Fesenmyer, Marion Local; Hayley Heitmeyer, Leipsic; Rachel Kreme,r New Bremen; Tess Lepley, St. Paul; Kierra Meyer, Leipsic; Lexi Smith, Notre Dame; Rachel Williamson, Antwerp. Addie Ackerman, Buckeye Central; Sophia Albers, Fort Loramie; Rachel Bleile, St. Paul; Madi Ellis, Delphos St. Johns; Katie Hiestand, St. Thomas Aquinas; Julia Holdheide, St. Henry; Addy Jarvis, Mathews; Stacia Stieber, Monroeville; Carley Stone, Fort Recovery; Lizzie Willis, Salinesville Southern. Kellee Applegate, Lordstown; Blaire Barr, Fairfield Christian Acad. ; Paige Bellman, Columbus Grove; Kamden Dulesky, Bridgeport; Erica Gasser, Rittman; Courtney Hahn, Lima Central Catholic; Caleigh Hamby, Newbury; Kelsi Hulit, Malvern; Alyson Johnson, St. Joseph Central; Olivia Lucia, Lehman Catholic; Carlee McCluer, Columbus Grove; Destini Oler, Mohawk; Madyson Paradie, Ashtabula St. John; Whitney Pleiman, Russia; Lyssi Snouffer, Delaware Christian; Jensen Warnock, Portsmouth Clay. Jackie Nye, Buckeye Central; Robert Shansky, Salinesville Southern; Eric Vackert, Carey; Kelsey Wolfe, Ottoville. https://www.mydailytribune.com/wp-content/uploads/sites/42/2017/11/web1_11.8-GA-Webb.jpgGallia Academy junior Ashton Webb (11) spikes the ball over a Logan Elm defender during the Division II district semifinal on Oct. 25 in Londonderry, Ohio.